Our aim and passion is to leave your windows glistening and sparkling. Whether it is around your home or business, our specialty is finding the perfect way to clean your specific windows, taking care to pay attention to every last detail. Due to our constant search for new ways to clean windows, we are able to offer services above and beyond that of your traditional window cleaner. Gutter cleaning is an important part of all building maintenance. Blocked gutters and downpipes can cause serious and costly damage. But who has the time to climb up a ladder and clean it out? That is where we come in. Viewmore Window Cleaning’s trained staff are experts in cleaning gutters who work in the safest, OH and S compliant manner to correctly and safely clean your gutters. Our pressure washer is the most cost effective and efficient way to remove the dirt and embedded grime from your paving, drive way or rendered homes. We are even able to remove oil stains. High pressure cleaning sprays water at 3000psi to completely remove all dirt from the surface leaving it looking like brand new again. We are fully trained in the use of high pressure cleaning machines, which gives you peace of mind that our employees will not damage your property. Our aim and passion is to leave your windows glistening and sparkling. Whether it is around your home or business, our specialty is finding the perfect way to clean your specific windows, taking care to pay attention to every last detail. Gutter cleaning is an important part of all building maintenance. Blocked gutters and downpipes can cause serious and costly damage. But who has the time to climb up a ladder and clean it out? That is where we come in. 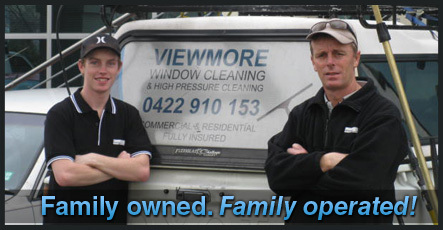 Viewmore Window Cleaning has been providing Melbourne with Window Cleaning, Pressure Washing and Gutter Cleaning since 2005. We are proud to service homes, business and body corporates across Melbourne. We are a family owned and family operated business. We are fully insured and trained in correct and safe working conditions. Keep up to date with out latest news and special offers by checking out our Facebook and Twitter pages. SEO Services not required. Please do not call.